Does the sensor consume a lot of electricity/internet data? What is the life expectancy of a sensor? Is it possible to build the sensor on my own? I don’t know my sensor’s ID, how can I find it ? Where can I find the data produced by my sensor? How should I set up my sensor at home once it is built? What kind of WiFi configuration should I use to connect my sensor? What is the best place to set up my sensor at? The particulate matter sensor as requires about 1 watt, if it would go through the whole year, that would be (1W x 24h x 365 days) / 1000 = 8.76 kWh so about 2.50 € / year. The data transferred through the internet by the sensor is very small, it will only transmit the ID, the time, the 4 data as text, which is negligible amount of data for your internet connection. According to the data sheet, the CPU of the sensor has a lifetime in continuous operation of approx. 8,000 hours. Therefore, the firmware only turns on the sensor for 20 seconds per measurement interval of 150 seconds. Thus, the theoretical life is 7.5 times higher. Practically, this should be enough for about 4-5 years of operation. However, it needs to be tested to know if this estimated lifespan is reasonable. There are still sensors that have been set up more than one year ago which still provide correct measurements. Simply cleaning the dust accumulated in the sensor every few months can help extend its life expectancy. There hasn’t been any rigorous study about the accuracy of the SDS011 so far. However, there are evidences that the measurements can represent pretty well the reality. First, you can see pretty good matching between some sensors and the monitoring stations on a local level, as it is shown on figure 1.6 below. Second, such matching has also been observed on an international level, as you can see on figure 1.5 below. 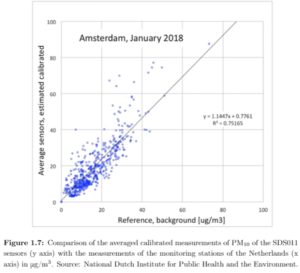 Third, the National Dutch Institute for Public Health and the Environment (NDIPHE) has conducted an experiment to test the accuracy of the data collected by the SDS011.They spread 110 DIY sensors in the end of 2017 in December in The Netherlands. After one month of measurements, they compared the data collected with the ones from the 40 official monitoring stations located in the Netherlands. 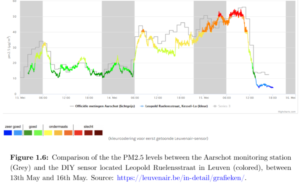 They concluded that the correlation was pretty good after slight calibration of the data (see figure 1.7 below) and hope they can use the sensors for official air pollution monitoring in the future. Watch the video about this test here. 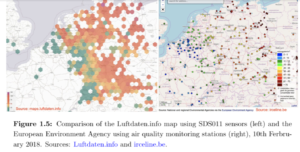 Those clues can let us assume that the data collected is good enough to raise awareness among citizens and give an idea of the pollution of the air. However, it is important to make a serious research about the sensor’s accuracy is the future, to know if the data is usable or not for scientific research such as epidemiology or other. However, the sensors’ measurement get abnormally high when humidity gets high, and too low with dry conditions. You should thus not take consideration of the measurements when it rains nor or very dry days. In those situations the data should be either dropped or calibrated. You should always compare the measurements with official ones. It is perfectly doable on your own, you need to order some pieces on AliExpress and others in a DIY store. You can follow the tutorial here, it is available in English, Dutch, German, French and Italian. You don’t need much knowledge in informatics to handle it. When you plug your sensor in an electrical socket, it will connect to the WiFi to which it has been linked to. But if it doesn’t manage to connect to the latter, it will start emitting a local network called “Feinstaubsensor-######”, where the hashes (#) show the ID of your sensor. So, bring you sensor far enough from the WiFi it is linked to, plug it into electricity, and you will be able to see its ID again. It measures PM10 and PM2.5 which mean Particulate Matter with the particle size in μm. The smaller the particulate matter, the more dangerous to human health. You can find the graphs of the measurements from your sensor by going to this address: “https://www.madavi.de/sensor/graph.php?sensor=esp8266-12345678-sds011”, change “12345678” with the ID of your sensor. You should also be able to see your sensor’s measurements on the map a few weeks after you deployed the sensor. However, for it to be displayed on the map, you need to send an email to rajko@codefor.de with the ID of your sensor, the address at which you set it up, and a quick description of the area. If everything went fine, you should have done this set up at the workshop after you built your sensor. If you did, the only thing you need to do is plug in your sensor at home in the range of your router and it will directly connect to it and start measuring. You can then go to section 2: Seeing the measurements. But, if you haven’t configured your sensor so it is linked to your router, you should follow all the steps below. Connect your sensor with the power cable to your computer or to an electrical socket. You can do all this while leaving the sensor in its casing. Make sure that your computer is close to the sensor during all the coming steps. Connect to your sensor as if it was a simple WiFi (no password needed). Wait a moment until the connection is made. It can take multiple attempts, we know it can be frustrating, but in the end, it works. Warning: the sensors can’t connect to 5.0 GHz WiFi. Most WiFi’s are 2.4GHz, but if you have a 5.0GHz, parameter your router so it provides 2.4GHz WiFi. As soon as your computer is connected to the sensor, put this link “http://192.168.4.1/” in your browser (Chrome, Firefox, Explorer, …). It should display a configuration page for your sensor. Again, it can take multiple attempts, to improve the chances of success, try connecting to your sensor and reloading the page “http://192.168.4.1/” until your browser displays the configuration page below. When you get to the configuration page, fill in the name of you WiFi next to WLAN (exact same characters), its password, then save the parameters. 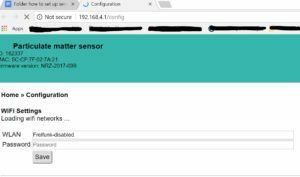 After that, your sensor should not produce any access point anymore, which means you cannot see “Feinstaubsensor-#####” when looking for WiFi’s. This means it is now connecting to your house’s WiFi (the one you filled in the parameters in your browser). 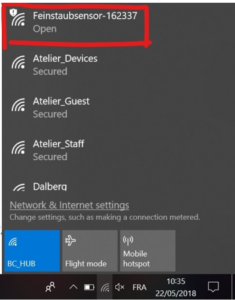 If you don’t manage to connect your sensor to the WiFi, try doing it with another device (smartphone, tablet or computer). The WiFi should be 2.4GHz, as the sensor doesn’t work with 5GHz ones. Most of the routers are 2.4GHz and the ones that provide 5GHz can be configured so they are 2.4GHz. Check that your WiFi’s name and password contain only common symbols, numbers and letters. The sensor can’t read every character so it’s better to stick to numbers and letters so it can connect to the router. On the first floor of your house and on the street side. Above the third floor, it is cleaner than the air pedestrians breathe, but it can still provide useful data.